In previous Natural Rhythms we have briefly touched on the unique property of water in that, unlike almost all other substances, water molecules expand when they crystallize, becoming less dense and floating above water’s liquid form. Surface ice provides insulation for the water below, allowing many ponds, lakes and rivers to remain mostly liquid through the winter, and aquatic life to persist through the year. 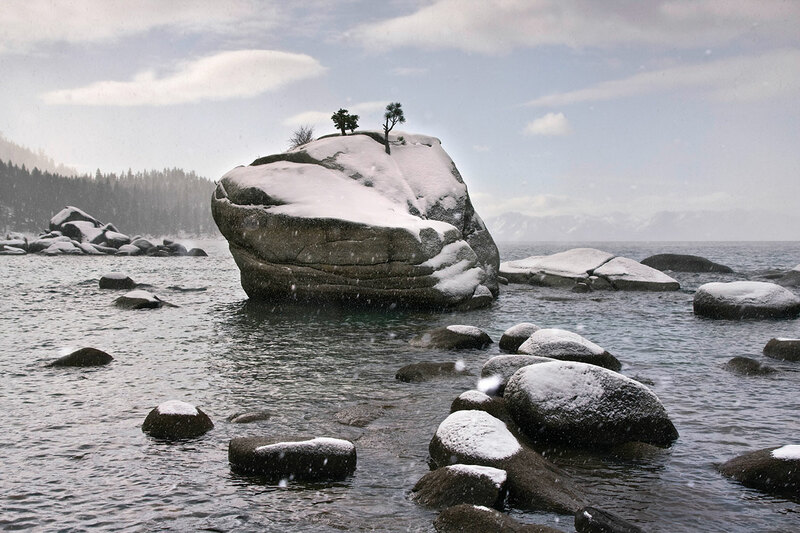 Curious is the fact that the surface of Lake Tahoe does not freeze, and many sources will cite Tahoe’s size, currents or a combination of the two as the explanation. Lake Tahoe’s size clearly cannot explain its lack of freezing, as Russia’s Lake Baikal has more than 160 times the volume of Tahoe, yet freezes so thick that freight is driven over its surface during winter. When one considers the currents and storms that move Arctic and Antarctic waters, not to mention the volumes of water involved, as well as the depths to which seawater freezes in those regions (and the fact that seawater freezes at approximately 28 degrees Fahrenheit), it becomes apparent that depth also cannot explain Tahoe’s lack of freezing. What it really comes down to is Tahoe’s impressive ratio of depth to surface area in the context of our relatively mild climate. Cold liquid water is dense and does sink, to a point. When water temperature drops below approximately 39 degrees Fahrenheit, it begins to rise back up to the surface. For ice to form, the entire water column must reach 39 degrees, at which time the surface water will remain at the surface, and can cool below freezing temperature. However, because of Lake Tahoe’s depth, cold water at the surface has a long way to sink, and the temperatures at the surface are never sufficient to cool the top 500 to 600 feet of The Lake below the critical threshold. Winter is a critical time for mixing Tahoe’s 41 trillion gallons. In the summer months, warm surface temperatures lead to stratification, with a considerably warmer layer on the surface and a transition zone in which temperature changes rapidly with depth, both buoyed above the denser, cooler water below 350 to 400 feet. Under these stable conditions, oxygen has a very difficult time penetrating to the deeper water and over time can lead to a dead zone at The Lake’s bottom. Stratification also dampens the cycling of nutrients through the water column. The timing and duration of this stratification is highly variable, though it is fair to say that it happens for about half the year. However, signs of climate change have already been revealed in the patterns of water temperature and stratification over the last few decades. Researchers at the UC Davis Tahoe Environmental Research Center (TERC) have reported that lake stratification now begins an average of 5 days earlier and persists 17 days later than when monitoring began in the late 1960s. Additionally, deep water temperatures have increased by one full degree Fahrenheit since 1970. This may not seem like much, but it is quite a large shift considering the volume of water, and it may have a serious impact on mixing. Other interesting changes occur during winter as well. Storms help stir up the water, adding oxygen and driving colder water down faster. Several feet of snow falling on the surface of The Lake during a storm will cause considerable rapid cooling and may cause ice to form in shallow areas. If the snow falls fast enough, it may even displace the water over portions of The Lake’s edge. Shorter days and a lower sun angle mean reduced ultraviolet radiation, which causes zooplankton and algae to move up in the water column. This can lead to significant shifts in the depth and activity patterns in the entire food chain. For fishermen willing to brave harsh conditions, stormy weather and dark days also appear to bring Tahoe’s lake trout out of the depths and close to the surface. With less solar input, much of the algae and phytoplankton simply dies off during the winter, and wave action from storms break down algae along the shore. The cooling, descending surface water helps to sink this material, and water clarity typically improves by tens of feet during this season. If The Lake is already stratified during spring runoff, the cold meltwater plunges beneath the surface waters and can help deliver nutrients and oxygen to the deeper layers. Runoff diving below the surface also helps with water clarity. In fact, with reduced runoff bringing less silt and pollutants into The Lake overall, our current drought is actually good for lake clarity, a very thin silver lining to an otherwise undesirable state of affairs. For more information about Lake Tahoe’s health, read TERC’s annual report at terc.ucdavis.edu/stateofthelake. Biologist Will Richardson, executive director of the Tahoe Institute for Natural Science, www.tinsweb.org, would like to thank Heather Segale at TERC for a useful discussion on this topic.